For directions and addresses, see the Directions page. Poster sessions and lunches will take place in Kimmel Center’s Rosenthal Pavillion (10th floor). Plenary sessions will take place in Kimmel center’s Eisner & Lubin Auditorium (4th floor). The tutorials will take place at the Columbia University campus, in rooms 501 and 602 of the Northwest Corner Building (NWC), and room 750 of the Schapiro Center for Engineering and Physical Science Research (Schapiro CEPSR). 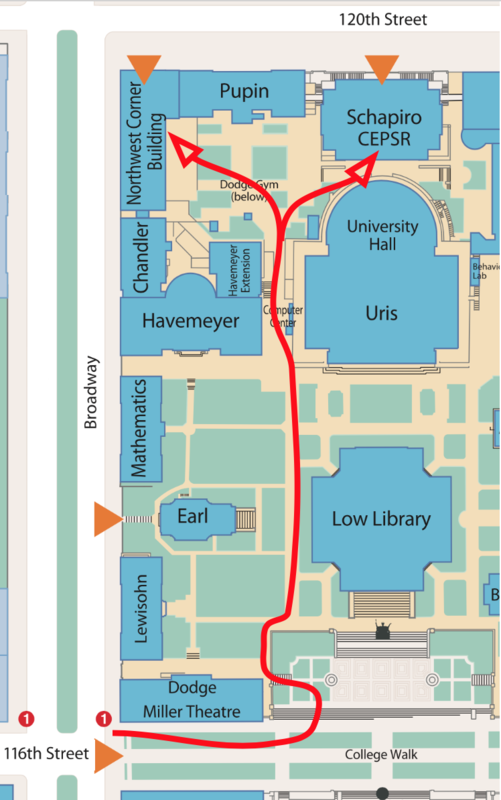 A map of the campus is provided further below. These buildings are both in the north-west corner of the main Columbia campus, at Broadway and 120th St. 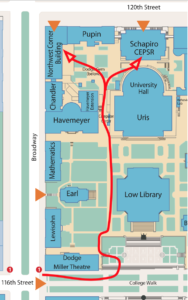 The easiest way to reach them is by taking the number 1 subway to 116th St, then walk through the Columbia campus to reach the buildings, as illustrated on the map below. (Don’t go to any other station called 116th St, for instance on the 2 or 3 trains – that station is much further east). Note: The street-level entrance to Schapiro CEPSR (from 120th St) will be locked on Sunday, and there will be a security officer at the campus entrance to provide access. You’ll take the elevator up to the 7th floor, then follow the signs to 750 CEPSR also known as Costa Commons. The street-level entrance to NWC from 120th St will be open; you’ll need to take the steps and the escalator to get to the 4th floor to reach the campus-level lobby, where you will seen signs directing you to 501 NWC, 602 NWC, and the breaks area.